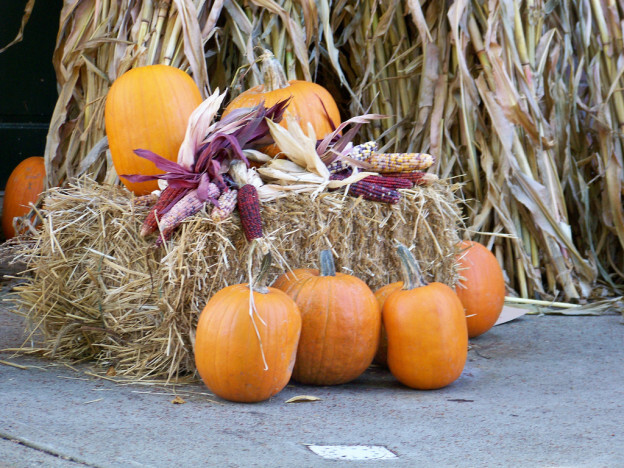 Do you decorate in the fall?? Indoors or out?? Do you decorate for Halloween or Thanksgiving or both?? When my kids were younger, I would put out decorations for Halloween. I was never a big fan of gory stuff, so our decorations consisted mostly of smiling jack-o-lanterns, cute black cats, friendly ghosts, and many of their past art projects. As they grew older there were often discussions (sometimes heated) over costume choices … I didn’t care for gory bloody hatchets or zombies 🙁 I know (I’ve heard it many times) I’m a mean mom .. Oh well! As my kids got older, I started getting rid of the more cutesy decorations and combined the two holidays into one fall / harvest season. I don’t display their grade school artwork anymore, but I do reminisce and cherish the memories when I’m unpacking the storage bins <3. I would concentrate on fall type items and only have a few strictly Halloween / Thanksgiving pieces. Then on November 1st, I’d trade out those pieces. Now that my kids are grown, and don’t really care much, I pretty much skip the Halloween / Thanksgiving specific decorations and concentrate on Autumn as a season. My outdoor decorations feature pumpkins and gourds, bales of hay, corn stalks, scarecrows and mums. I like it to have a harvest feel … as I’m starting to put my garden to bed for the winter. Tracy Helps You would love to help you decorate … we can put our heads together to create something you’ll love.